Today my two candidates completed the AI course part of the IDC by passing their 5 theory exams in the morning and in the afternoon we had an Open Water dive where they each had to perform two skills as an Instructor. Full concentration during their 5 Theory exams. Which they passed with flying colours, to the relief of all of us. The lowest score was 85%. 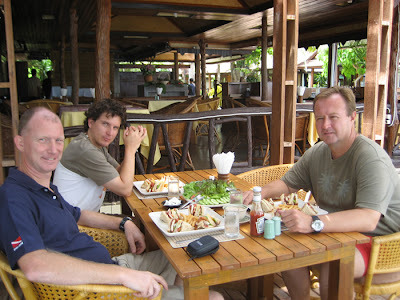 After the exams we all three are enjoying our lunches at the beach side restaurant of World Resort. The food must be a reason in itself to participate in one of my IDC's! Today we had Western style food; club sandwiches, all other days we get up to 4 Thai dishes to share! 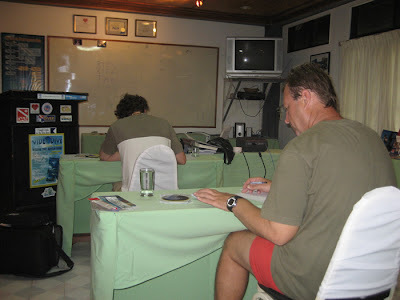 Bas during his briefing of his two skills on Chaweng Beach. Jamie is listening in the background. 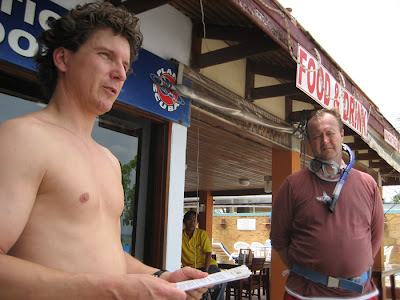 The Open Water dives are normally conducted from Chaweng Beach. 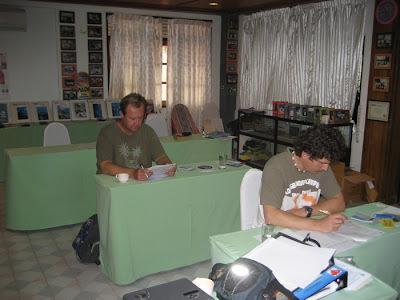 All classroom and confined water dives are held at World Resort in Bophud. 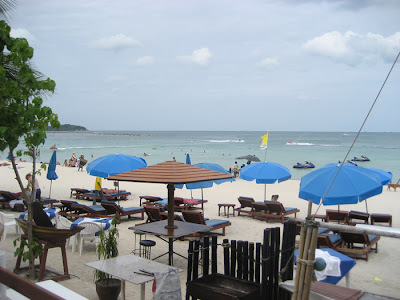 A view on Chaweng Beach from Samui International Diving School's shop on Chaweng Beach. It was nice and sunny out on the beach although the beach was not so busy today. Tomorrow we have a day off and on Wednesday we continue with an all classroom day and start the OWSI program. So far they both have been doing very well and it's been an enjoyable course so far.